We stand with the Jewish community and the victims of the tragic shooting at the Tree of Life Synagogue in Pittsburgh, our union’s home city. We stand with their families, friends, first responders and all those suffering and we offer our sincere condolences. We will be relentless in our call for unity for we know its power. We will continue to raise our voices against and will continue to collectively act to end anti-Semitism and hate of any kind - in our city and around the world. The power of unity is greater than hate. So as we mourn too many tragedies caused by division we pledge to redouble our efforts to combat the prejudice that motivated this heinous act of violence. 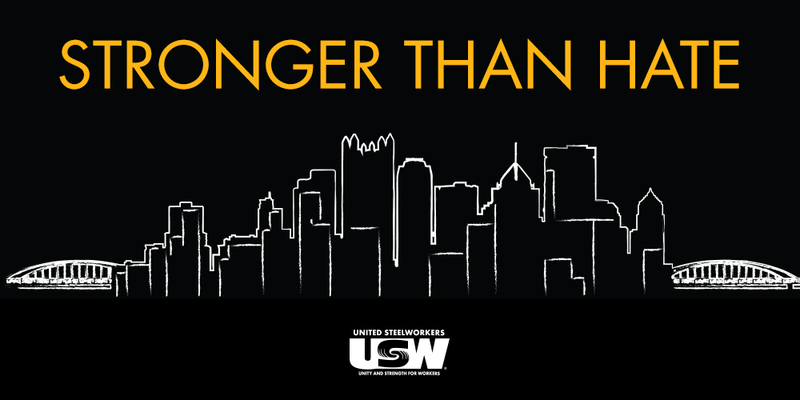 We must focus on the massive inequality that is the root of these divisions because as our union’s founding principles point out, it is our duty to serve as a unifying force for all workers. This is a conversation we cannot delay or dilute. We must stand together, in unwavering solidarity, with communities everywhere in the struggle to bring safety, freedom and equality to all. Click here for our full press release about the Tree of Life shooting and the need to for unity.